SWAT+ Editor is still in the early phases of testing and development, so please proceed with caution. 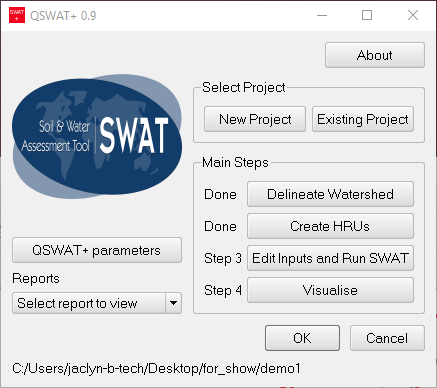 First get your project set up in QSWAT+. After your project is set up, create a back up copy; SWAT+ Editor manipulates the database, so during these early stages it is good to have a copy of your project before opening it in the editor so that you may start over if needed. To open SWAT+ Editor, click the button for Step 3: Edit Inputs and Run SWAT from QSWAT+. Please watch the guide video before launching SWAT+ Editor. This video will quickly walk you through the steps needed to bring your QSWAT+ project into the editor, as well as show you how to catch and report errors. If you encounter an error, please follow the steps at the end of the guide video for capturing them fully. Contact Jaclyn by email or report the issue to the SWAT+ Editor issue tracker.